Sorry I didn't post over the weekend, I had a big exam to study for! Physiological Psych will be the death of me, but I think I did okay this time around. Anyway I've been reorganizing my makeup and I thought I would continue my collection posts with my bronzer collection! I've also done a highlighter, blush, and liquid lipstick collection if you would like to see those. I wear bronzer everyday but I always tend to go for the same golden brown shades, so I don't purchase a lot of bronzers otherwise I would just get the same general color and formula every time. My Ipsy subscription lets me try out new formulas often and I'm very happy with the bronzers I've purchased myself, so I consider my collection to be complete! This is definitely one of my favorite and most-used bronzers! It's matte, neutral, pigmented, and blends nicely. I like to use it for both contouring and all-over bronzing. This would probably work best for light to medium skin tones, but it may be too dark or light for the paler and deeper ones! I've heard that Benefit is coming out with a lighter version of Hoola so hopefully they will make a darker one, too, because this is such a popular product. I got this matte blush/bronzer duo in an Ipsy bag and I like to use the bronze shade when I'm traveling. 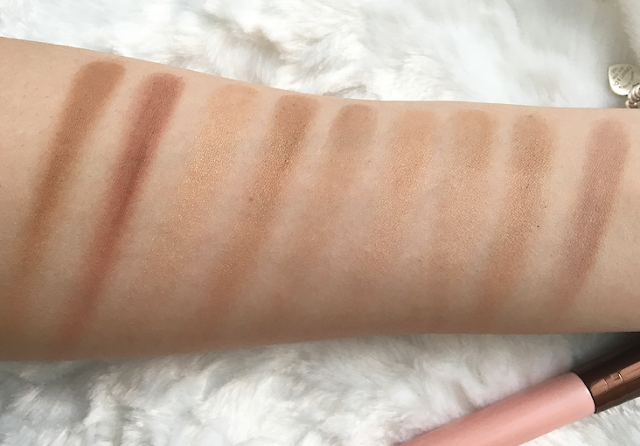 It is quite dark so I have to use a light hand with it, but it can be a good contour shade and all over bronzer, especially in the summer when my lighter shades don't seem to add enough depth. I really like Physicians Formula powder products so when I found this on sale I decided to test it out! It's on the pricey side for a drugstore product but it's worth it in my opinion. It's a baked bronzer that is very smooth and shimmery. Again, this is a nice one for the summer to really add a sunkissed glow! This is the first high-end bronzer that I bought and I still use it constantly, although there isn't even a dent in it! This is a warm golden-brown shade with a little shimmer in it. It never looks muddy on me and I just feel like it's my perfect bronzer. Not too shimmery, the perfect tone...if you have a skin tone similar to mine, check out this classic! Another Ipsy sample, I rarely reach for this because it's such a horrible sample size. It swatches nicely but honestly I just forget that I have this because it hides behind my bigger compacts. The shade is slightly cool-toned so I think it would be good for some light contouring. I might check out the full size the next time theBalm is on Hautelook! I think that this is the best drugstore bronzer I've tried! It has a beautiful sheen to it, but no shimmer or glitter. It blends beautifully on the skin and has a nice tropical scent to it. It has a neutral tone and is not very pigmented, but in this case I think that's a good thing because it's nearly impossible to go overboard with it. This is very light so it's definitely better for fair skin tones! Physician's Formula is one of the worst brands for diversity in my opinion, even with their foundations and BB Creams they only come out with about two shades. I love Too Faced's chocolate line--the palettes, the lipsticks, and this bronzer! It smells like cocoa and that makes me happy every time I open it. It's slightly warmer than Hoola so I don't usually use it for contouring, but it's also matte so it's a very natural-looking bronzer. It's also not as powdery as Hoola in my opinion. This one does come in a variety of shades so there is a bronzer for everyone! I believe Milk Chocolate is the lightest shade, then the original Chocolate, then Dark Chocolate. I got this sample size in an Ipsy bag and I only reach for it when I'm traveling. It looks darker than I usually go for but it applies lighter on the skin so long as you're careful with it. I wouldn't purchase a full size but if you struggle to find darker bronzers at the drugstore this might be one to check out! The texture is not as smooth as my other powders, either, but I don't notice that this looks muddy or patchy on the skin. Overall it's not my favorite or one that I would repurchase, I mostly keep it because of the convenient size. This duo is an incredible value, you get two giant powders for about $5! The powders are both incredibly smooth, matte, pigmented, and blendable. I know Dulce de Leche, the other shade, is very popular on YouTube but I think Caramel Toffee deserves more hype. 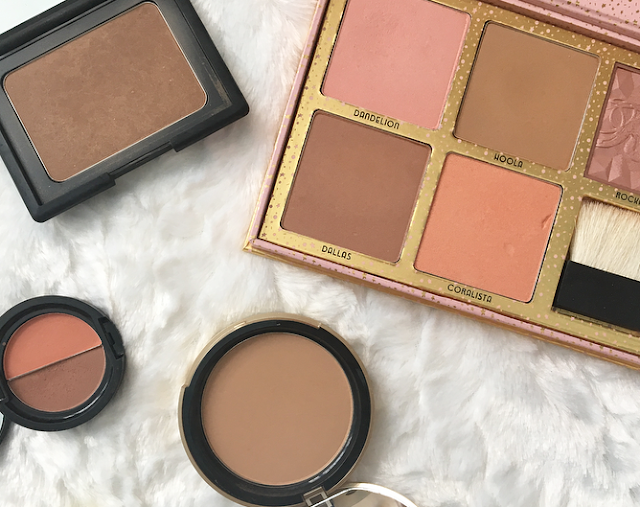 The contour shade is perfect for creating a shadow and the powder is a much better shade for my skin tone than the yellow-toned Dulce de Leche. Whichever one you go for, this is a great formula and I can't believe how affordable it is. As you can see from the swatches, these are all quite similar shades but they get a lot of use and I think they look the most flattering on my fair skin. 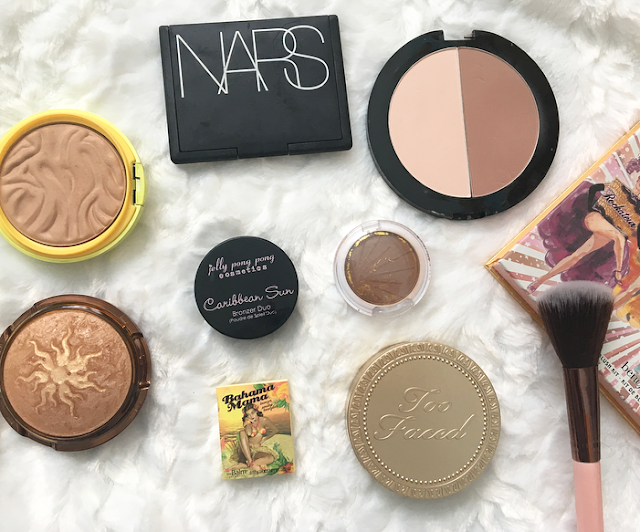 Whether you prefer matte or shimmery bronzers, I hope you found something here to check out! 8 comments on "Bronzer Collection"
You have such a big collection! I don't think I have much, but the Hoola & Chocolate Soleil bronzers are some of my faves as well! I love that Physician's Formula bronzer! I remember loving the NARS Laguna bronzer. I believe it was my first high end bronzer as well. I need to repurchase it, and try the PF Butter Bronzer! I love the Bahama Mama and the Too Faced Chocolate Soilel! You have quite th nice collection! You have pretty nice collection of bronzers. I love the one from Physician's Formula and Too Face. Those are my babies.